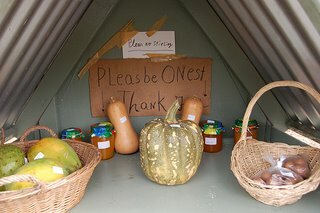 Stopped at this wonderfully charming and unique roadside produce stall in Julatten today. at least it doesn't say "thankyou". I am just about ready to attempt a citizen's arrest on the next lamebrain at work or in my industry who insists on mindlessly aping what some fool started in ignorance. Giving a thank-you is acceptable; saying thankyou isn't. Neither are many of the other words and phrases which mascarade as business communication (oxymoron?). From Charlie Myres who thinks it means "reducing arguments"